Play with Bitcoin at Slots.com and get a bonus up to 1 BTC! A mobile-first bitcoin casino ideally suited for those who love slot games. New players will be able to enjoy a 100% matching of their initial deposit bonus that will go all the way up to 1 BTC. 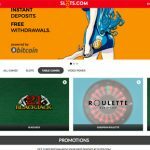 For anyone who is into mobile bitcoin gambling, Slots.com is a place that can provide them with a perfect alternative. Created as a mobile-first portal, the same website is designed and operated to support gambling on mobile devices like tablets and smartphones. Because of the primary purpose of serving the mobile gaming crowd, this licensed online casino made sure that all about it caters to this audience. While this might come with some drawbacks for those who use the website on a computer browser, the key focus of mobile gaming is delivered by Slots.com perfectly. The games presented in this digital casino fall under one of three big categories. These include video poker games, slots, and table games. Slots come in a range of colorful presentations, covering anything from fantasy themes to ancient history. Table games, on the other hand, include blackjack, European roulette, and other classic table gambling possibilities. Finally, a relatively limited offer of video poker games includes several different versions of the card game, like Double Double Bonus Poker, Jacks or Better and Joker Poker-1 Hand, just to name a few. 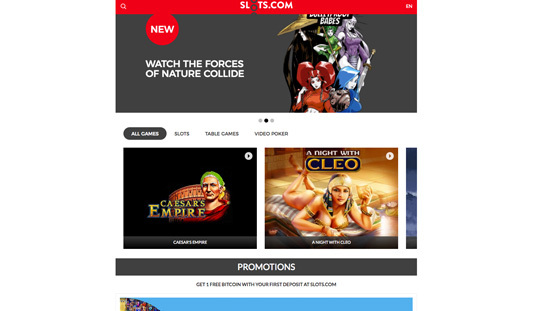 Like the name says, Slots.com definitely made the biggest effort for its slots games. Here, the individual games differ quite a bit amongst each other and all have been created with both aesthetic and functional characteristics in mind. Inside of the casino, choosing one of the games takes the player to a new screen where the gambling can begin. While the graphics meet most of the current industry standards, they might appear bulky on a PC or Mac, mainly because they were designed primarily to be used with a lot smaller device than a computer screen. When it comes to the game odds, they are verified by a third-party entity, which is, in this case, the iTech Labs Company. The sign up process can only be described as very smooth for this online casino. Slots.com form includes a need for a working email address, a password and a username that will be employed in the casino itself. One of the biggest selling points for this casino is the anonymous gambling feature that is provided by the bitcoin payments. This means the identity of the casino users is fully protected and anonymous not just from other users, but the owners of the casino as well. 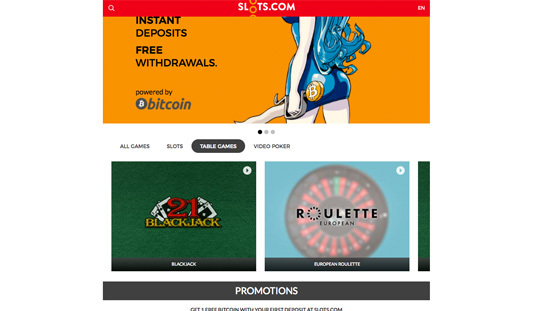 Slots.com uses only bitcoin (BTC) as a means of both withdrawals and deposits. There are no limitations when it comes to withdrawals as long as the user has a working digital wallet to which the funds can be played out or from which new deposits can be made. However, there are some limitations of payouts generated from the initial sign up bonus. It is also important to mention that both withdrawals and deposits are free. Slots.com provides a single big bonus that is available on sign up and this includes one instance of 100% matching of the player’s initial deposit. The same bonus goes all the way up to 1,000 slot chips or one bitcoin (1BTC). But, the same deposit and bonus are subject to a 35X playthrough before any potential winnings can be withdrawn. All the available games provide a contribution to this playthrough, but not all games are equal in this matter. All of the games provided by the Slots.com are designed first and foremost for tablets and smartphones. This goes for the actual games, but also the entire user interface of the site and all of its features. This is why the casino does not require any stand-alone apps to be played and enjoyed – all that is needed is an internet connection and a connectable device. Slots.com offers a support process that is based on an embedded message system inside of the website. The support services will reply to any message in a matter of 24 hours. There are no live forms of support, either by chat or phone as of this time.